Russian officials say Jehovah's Witnesses detained for their religious beliefs beat and burned themselves and were not tortured while in custody. Human rights lawyers and activists said the suggestion was "laughable". The organisation was banned in 2017 as an "extremist group" by Russia's Supreme Court, and dozens face criminal charges and long prison sentences for practising their faith. One Danish national is serving a six-year prison sentence - labelled a "minimal" sentence by the court - after he was arrested at a prayer service following the ban. 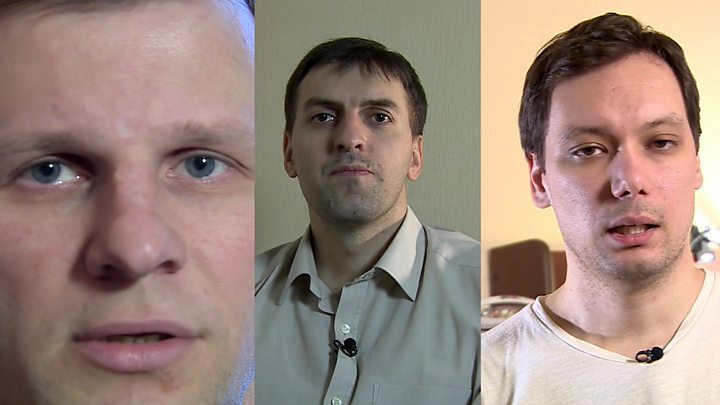 On Wednesday, the Russian investigative committee in Siberia's Khanty-Mansiysk region said the claim made by the men was an "attempt to influence the investigation and is aimed at discrediting the security forces," the BBC's Sarah Rainsford reports from Moscow. In a statement, the committee said its initial investigation had found that "active resistance" during a search of the men's homes in February resulted in "minor abrasions and bruising". It also claimed that forensic tests showed other injuries, including burns, which "could not have been caused" in custody "but were created later". Previously, medical certificates shown to the BBC by the alleged victims said their burns were "consistent with electric shock". A new forensic report commissioned by their lawyers has confirmed that the injuries do correspond with the date of their arrest. Activists and lawyers are now calling for a full state-level investigation, after local officials in Surgut dismissed the allegations. They argue that regional officials cannot be trusted to investigate their colleagues. "It's laughable. It's all proven." They are asking for a full criminal inquiry and for those accused to be suspended pending its outcome. At a press conference on Thursday, human rights groups distributed photos of some of the injuries, and video footage obtained from the search of the men's homes. It showed large search teams, including armed men and men in masks - both state security and riot police. The material provided showed no sign of any of the men putting up any resistance. In a previous interview with the BBC, one of the men, Artyom Kim, said: "I thought they'd kill me, because they were threatening me and my family." "When they were suffocating and shocking me, and I thought I couldn't breathe, they said, 'will you talk'? And I said 'yes'. "Because I thought: a couple of more times and I'll die." Another told our Moscow correspondent that they put a bag over his head to suffocate him and electrocuted him as he fought for air. There are an estimated 170,000 Jehovah's Witnesses in Russia. Practicing the faith is not itself explicitly illegal, but the ban against the organisation as an extremist group has led to significant confusion over the distinction between the two. Even Russian President Vladimir Putin said in December that he could not understand why followers of the religion were being persecuted. Yaroslav Sivulsky, a representative for the Jehovah's Witness group, said repression has only increased since the imprisonment of Danish national Dennis Christensen. He said the "sad statistics" showed around 100 searches since February, and 56 new criminal cases. One well-known lawyer, Anatoly Pchelintsev, suggested that police were chasing easy targets. "The security forces are measured by results. And they give special value to cases of terror or extremism," he said. "So who else can they catch? They go after the pacifist Jehovah's Witnesses, to make up their statistics and justify their own existence. Because Russia's security forces have never been so big."